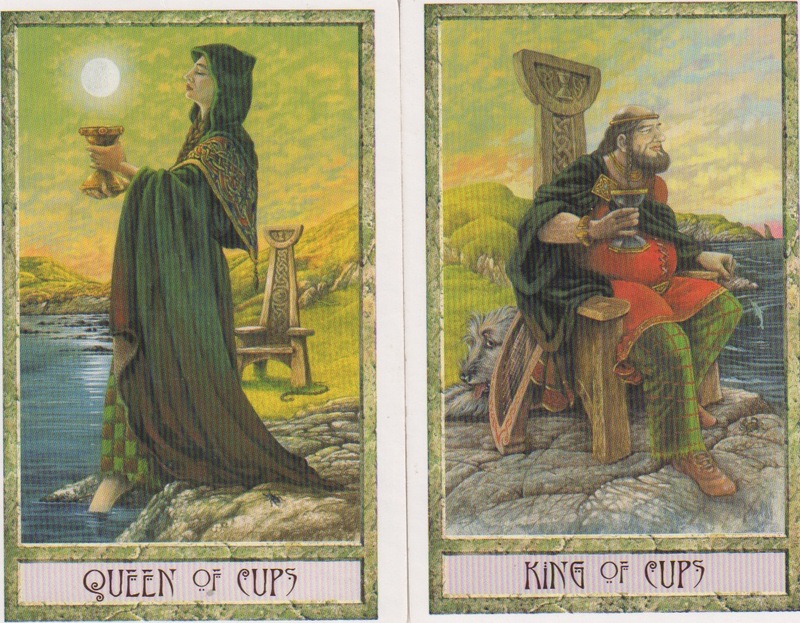 Reverting once more to the glorious Court Cards of the Druidcraft Tarot, I’m introducing you to Mr and Mrs Cups. The Queen of Cups stands on the shore of some tranquil waters, her bare toes dipping into the glassy cool depths. Unlike the other Queens of the Druidcraft, she is standing, her throne can be seen some steps away with a serpent lying close at hand. Her hair is covered by an elaborately embroidered hood and she stands, eyes closed (or downcast?) as she holds her golden cup before her, as if she is working a ritual. The full moon floats eerily above the chalice, almost like an accessory in a conjuring trick. The sky is changing – either dawn or dusk. I like to think of it as dusk because the Cups rule the Autumn and the West and so dusk is the time of day that resonates with these qualities (Wands being midday, Pentacles being midnight and Swords being dawn). These times of the day are special – offering us gateways to travel between worlds. The atmosphere in the card feels silent, but somehow charged-up by the Queen’s actions. The characters feel like Irish Celts – from the embroidery and colouring of her robes to the snake on the ground. In Ireland the Christian church drove out the druids (the adders) and that’s why there are no snakes in Ireland. Or so the story goes. So she’s definitely got Irish Druidy connections for me. As Water of Water, she vibrates to a single element – love, compassion, empathy and the creative impulse are very strong. 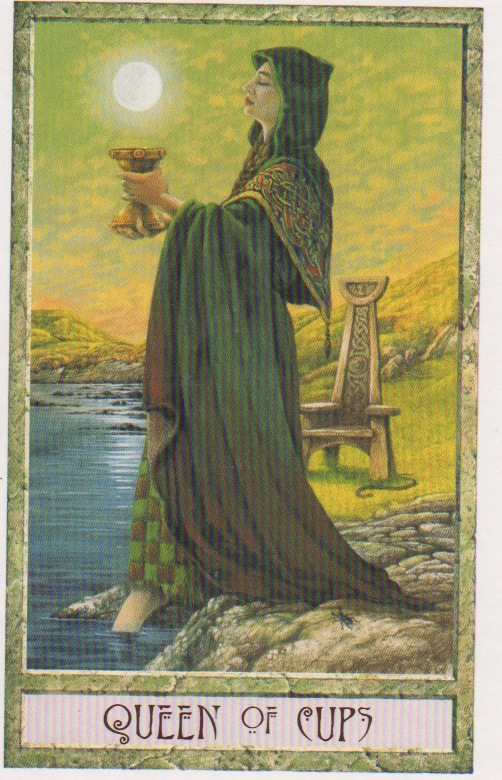 An ‘unhealthy’ Queen of Cups (ie reversed position) could be manipulative, selfish, clinging and *cough* wet. To remain healthy, she needs to ensure that it’s only her toes that get into that emotional water! Take a look at the King. He sits on his throne like a well-stuffed sofa! His crown is bald and he wears a circlet of gold. He does not face out towards us like the Wands King and his close relation the King of Swords. Instead he looks off to the right, an attitude that I associate with looking to the future. He is musical – his harp lies by his side. And a great wolfhound lies behind his throne. This is a loyal husband and a wise man (see the salmon of wisdom in the watery depths). He does not enter the water. Unlike the Queen, the King is Water and Fire. He is aware of the emotions (he looks out over rippling water) but he does not act from them. He can understand your emotions but is perhaps better at knowing what needs to be actually DONE. In this respect he is a master of diplomacy. But he can be found working in the caring professions, where what you need is a compassionate response, but someone who is still able to take action. There can be a conflict going on within this man. Sometimes what he needs to do is at odds with how he really feels. So he can really feel stressed out by situations when this conflict arises. He sits in a similar dusky landscape with the sun just going down. But whereas the Queen has Irish connections for me, the rock formation in the distance of the King’s card looks like the Old Man of Hoy, which is on the Orkney islands of Scotland. So you can make up your own mind about this duo’s Celtic origins! There have been ruins found on Orkney of a settlement called Skara Brae that archaeologists are increasingly convinced are the ruins of a centre of artistic/spiritual leaders…. perhaps like Anglesey was for the Druids? Perhaps the Cups are from this community? Placing them side by side, The King looks at his Queen. More specifically, he looks at her cup. In fact, even if you line up their horizons, the King still looks at her Cup. His focus is not on her beauty or form, even though they face each other. And her eyes, as we have noted, are closed. Placing them the other way around, the figures are back to back. With the Queen looking to the left which is, for me, looking back to the past, to the Old Ways. Whereas the King looks out to the right, to the future…. What do you think? What would you add to the King and Queen of Cups? WOW, I never noticed the landscape lining up like that! Thanks for pointing that out!! I like how the moon is placed hovering over the Queen's cup,offering mysteries or some special energy here! I like when tarot card Queen of Cups is joined by The High Priestess, it seems I get the best of both worlds. The indifference of The High Priestess is balanced by the affectionate side of Queen of Cups. 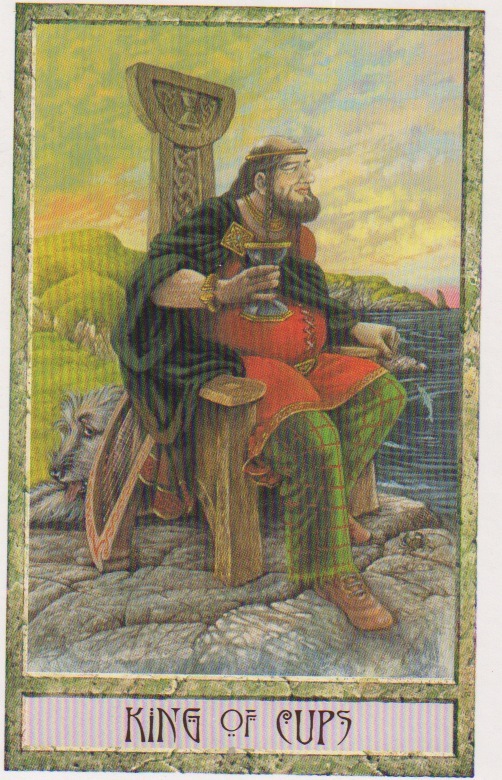 I love this deck…the cups are always lost in the water of their memories and the wetness of their emotions. They look for the path of least resistance. Good interpretations of these cards – it captures the tendency of cups to be overly analytical or overly sentimental. Ties in nicely with The Hermit and The Moon – always longing for something. 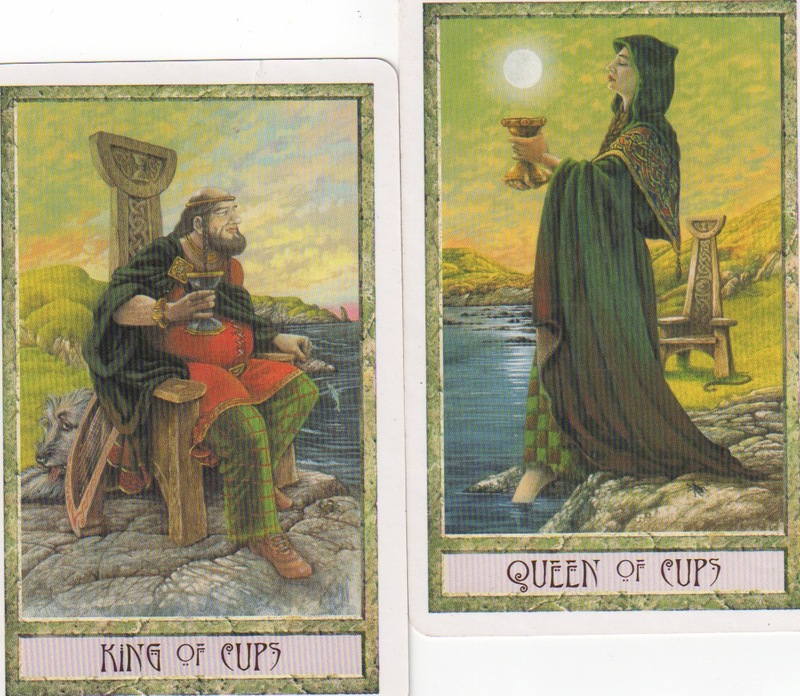 I see some similarities between the Hermit and the Queen of Cups in this imagery! The Moon hovering over the Cup looks a bit like a lantern, and in some depictions of the Hermit (e.g. Sharman-Caselli) a snake is shown, symbolising transformation. Thanks for reminding of me of the dawn and dusk associations!